Kianpour, M., Sabbaghi-Nadooshan, R. (2014). Novel Design of n-bit Controllable Inverter by Quantum-dot Cellular Automata. International Journal of Nanoscience and Nanotechnology, 10(2), 117-126. M. Kianpour; R. Sabbaghi-Nadooshan. "Novel Design of n-bit Controllable Inverter by Quantum-dot Cellular Automata". International Journal of Nanoscience and Nanotechnology, 10, 2, 2014, 117-126. Kianpour, M., Sabbaghi-Nadooshan, R. (2014). 'Novel Design of n-bit Controllable Inverter by Quantum-dot Cellular Automata', International Journal of Nanoscience and Nanotechnology, 10(2), pp. 117-126. Kianpour, M., Sabbaghi-Nadooshan, R. Novel Design of n-bit Controllable Inverter by Quantum-dot Cellular Automata. 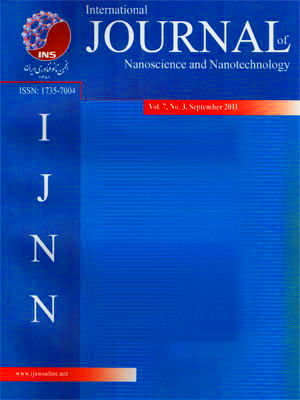 International Journal of Nanoscience and Nanotechnology, 2014; 10(2): 117-126. Application of quantum-dot is a promising technology for implementing digital systems at nano-scale. Quantum-dot Cellular Automata (QCA) is a system with low power consumption and a potentially high density and regularity. Also, QCA supports the new devices with nanotechnology architecture. This technique works based on electron interactions inside quantum-dots leading to emergence of quantum features and decreasing the problem of future integrated circuits in terms of size. In this paper, we will successfully design, implement and simulate a new 2-input and 3-input XOR gate (exclusive OR gate) based on QCA with the minimum delay, area and complexities. Then, we will use XOR gates presented in this paper, in 2-bit, 4-bit and 8-bit controllable inverter in QCA. Being potentially pipeline, the QCA technology calculates with the maximum operating speed. We can use this controllable inverter in the n-bit adder/subtractor and reversible gate.